Sweet peas are so easy to grow and ideal for the impatient gardener or a good starter for children who want to see results quickly. Flowering profusely, just a few packets of seeds will give you fresh posies of flowers daily for weeks. Traditionally a cottage garden plant, they are frequently used in all types of garden.They are particularly lovely by a door or a window where the scent can be frequently admired. Sweet peas were discovered by a Franciscan monk in Sicily in 1697.The original blossoms were smaller than we know today and were purple.They were bred enthusiastically and the frilly variety became available and gained popularity in the mid 19th century.As the Victorian fashion for bold showy flowers took hold, the sweet peas were bred more for size and visual impact, but at the cost of the scent.Then fashion changed and the appeal of traditional cottage garden flowers with the lovely scents returned again and, like fashion, the little sweet pea came full circle. Romantics are drawn to the sweet heady smell of these exquisite flowers and the benefits of flower scents always include lifting the heart into a happy state.Sweet-smelling cottage garden plants were written about by Charles Dickens when, in 'Oliver Twist', the young boy recovered his health in a garden of flowers that 'perfumed the air with delicious odours'. Of course sweet peas are a member of the Pea family – but they are definitely not edible and are poisonous. In spring you can grow annual sweet peas in pots or straight into the ground.The sweet pea seed is a dark brown round seed which looks like a peppercorn. The most common seed mix is a for flower colours of pink, red, purples and white, although single colour seed packs of these are available. Growing sweet peas is very easy and inexpensive.Choose your variety and plant in spring into pots or straight into the ground.Soaking the seeds first in tepid water or overnight to help rehydrate them encourages faster germination.I suggest plating 3-4 seeds per pot to make a bushier and more robust plant.Transport your little pots of plants into the garden when the risk of frost has gone.Cover the seeds with 1cm of compost and put them in a bright sunny spot.Sweet peas like moisture, so water regularly.Young seedlings become leggy, so encourage side shoots by pinching out the tops above a pair of leaves.The more shoots there are, the more flowers you will get. 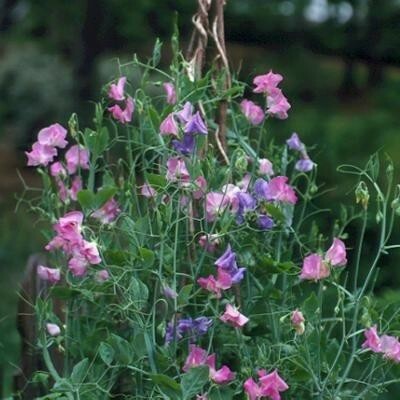 Sweet peas climb so they need plant supports.These can simply be canes tied together in a wigwam shape or a garden trellis.Once the plant is in flower, dead head it regularly to encourage more flowers. There is also a perennial sweet pea which produces a bright pink flower which weaves happily through plant supports or hedgerows, and although not scented, it is a feast for the eyes.